File Manager helps you manage all your files efficiently! With an intuitive interface, File Manager allows you to handle any file or folder whether they are stored in your device, microSD card, or cloud storage accounts. With File Manager you can easily copy, move, rename, delete, find, share, explore, compress, and otherwise organize all of your files on any of your storages. 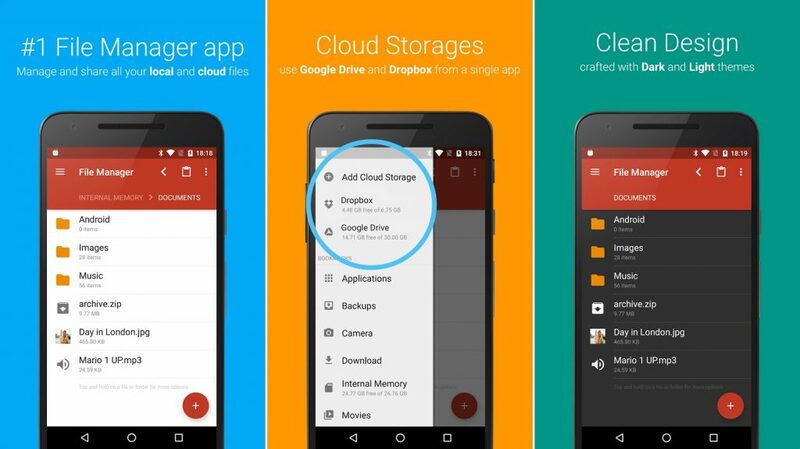 More storage options, also with Clouds: Supports multiple cloud storage accounts such as Dropbox and Google Drive, all from a single app. Also explore your external storages like microSD cards and USB OTG drives (if supported). Save disk space by compressing files: Compress files to save space on your storage and extract compressed files in Zip, RAR, Tar, Tar.gz, Tgz, Tar.bz2, and Tbz formats. Applications manager: Manage and back up your installed Android apps and games, share them with friends, or free up some memory by uninstalling old software. Your smart file explorer: Search, open, rename, move, delete, or share files that are stored in your device's internal storage, microSD card, or cloud storage accounts. Use the beautiful built-in image gallery to quickly browse your pictures, including animated GIF. Multi language: File Manager supports 29 languages including: English, French, Spanish, Italian, German, Dutch, Japanese, Korean, Traditional Chinese, Simplified Chinese, Indonesian, Russian, Polish, Portuguese, Turkish, Ukrainian, Vietnamese, Arabic, Norwegian.